As milk from her breasts. Growing deeper as it vanishes. And receding eyes in my mother tongue. Poured their love like saliva. Is a story where I learnt about my past. Forest fires, puberty and heroic love. I grew up mostly away from my mother tongue. Outside the lullabies of my mother tongue. I fell in love with melodies and eyes from other languages. Other languages with their bottomless snares. And lost some of her own. But never reach the altar. Goes as far back as Kunti. Who gave birth to her sons. Her silence gave birth to a mythology. Her secret is however part of my mother tongue. Has been fixed into someone’s mouth like a tattoo. Would be stains of slaked lime and catechu. Is a jar of pickles preserved under a rotten shade. Like medicines in the cupboard. Have lost each other’s company. And still has tears for old songs of love. Still manage to hold her heart. She would like to be as a woman. The mother of the Pandavas in the Indian epic, The Mahabharata. Manash Bhattacharjee is a poet, writer, translator and political science scholar from Jawaharlal Nehru University. His poems have appeared in The London Magazine, New Welsh Review, The Fortnightly Review, Elohi Gadugi Journal, George Szirtes’ Blog, Warscapes, First Proof: The Penguin Books of New Writing from India (Volume 5), The Missing Slate, The Little Magazine, etc. His first collection of poetry, Ghalib’s Tomb and Other Poems (2013), was published by U.K’s oldest literary journal, The London Magazine. 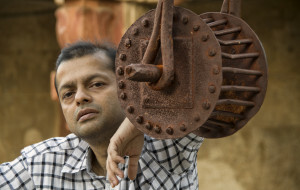 He is currently Adjunct Professor in the School of Culture and Creative Expressions at Ambedkar University, New Delhi. Previous story Excitable Speech and the Politics of the Womb – Wake Up Grrrl!